We’d love your help. 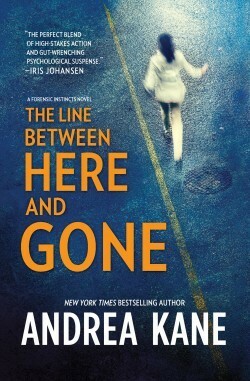 Let us know what’s wrong with this preview of The Line Between Here and Gone by Andrea Kane. The man she loved is gone forever. The child she lives for could be next. One emailed photo changes everything, planting a seed of doubt tha The man she loved is gone forever. The child she lives for could be next. To ask other readers questions about The Line Between Here and Gone, please sign up. This was an interesting story with good characters. It had a happy ending and was a pretty easy read. I would definitely read another book by this author. I enjoyed the FI crew she developed in the story. Will have to read book #1 also. I did enjoy the story, not too much of a "thriller" but a good mystery type story. Amanda Gleason is at her rope's end. Her one-month old son, Justin, is fighting for his life. He has a rare disease and he needs a bone marrow transplant. Unfortunately for Amanda, her Hepatitis C prevents her from being a donor candidate. What she needs is Justin's father, but he was murdered eight months ago. On a rare break at the hospital, Amanda receives a text from a friend. The text contains a picture that looks just like Paul, her old boyfriend who was killed. Grasping at straws, Amanda i Amanda Gleason is at her rope's end. Her one-month old son, Justin, is fighting for his life. He has a rare disease and he needs a bone marrow transplant. Unfortunately for Amanda, her Hepatitis C prevents her from being a donor candidate. What she needs is Justin's father, but he was murdered eight months ago. On a rare break at the hospital, Amanda receives a text from a friend. The text contains a picture that looks just like Paul, her old boyfriend who was killed. Grasping at straws, Amanda immediately moves into action and goes to FI, Forensic Instincts. There, she begs them to let her hire her. They have a reputation of closing cold cases and getting results, where normal law enforcement can't go. After their initial coverage of the case, the team is sure that Paul is alive. A no-body homicide with too many loose ends sets the team into deep investigation on many levels. Not only do they find out that Paul was involved with the mob, but it seems that leads take them straight to Washington. Amanda's baby is running out of time, and her wealthy uncle, who is footing the medical bills, isn't looking too clean. The team is has many talents, but will they find Paul before it's too late for Justin? Or will Amanda have to find another way to save her son if Paul is really dead? As the secrets are revealed, the danger increases around Amanda and her infant son. I always look forwrad to Kane's books, and this one did not disappoint. I enjoyed reading about the members of Forensic Instincts in The Girl Who Disappeared Twice, but I liked this book even more. I thought that the characters were wonderful, the storyline was gripping, and I already want to read more. This book had everything I could have wanted in a mystery. Casey Woods and her Forensic Instincts team are contacted by a desparate mother whose only hope for her baby's survivial is to find his m I always look forwrad to Kane's books, and this one did not disappoint. I enjoyed reading about the members of Forensic Instincts in The Girl Who Disappeared Twice, but I liked this book even more. I thought that the characters were wonderful, the storyline was gripping, and I already want to read more. This book had everything I could have wanted in a mystery. Casey Woods and her Forensic Instincts team are contacted by a desparate mother whose only hope for her baby's survivial is to find his missing father, who has been believed to be dead.. They must race against time to gather information and sort clues to find out the truth about baby Justin's father. It becomes quickly clear that there are powerful people involved who do not want them to get answers. Stunning revelations occur as the Forensic Investigations team digs for the truth. (I received an ARC from NetGalley in exchange for an honest review). Amanda Gleason's infant son, Justin has a rare immune deficiency that only one person seems to have a cure for...his late father. Paul was murdered before Amanda even had a chance to tell him she was pregnant. Just when time seems to running out a friend sends her a photo that shows a man who looks a lot like Paul. Amanda wonders if Paul may be alive. If he is he could save his son's life. A desperate mother falls at the mercy of Forensic Instinct - A behaviorist. A former navy SEAL. A techno-wizard. An intuitive. A retired FBI agent. A human-scent-evidence dog - to not only do the impossible but in the shortest amount of time. This was a book that once you get caught by the story you just can not put it down. Knowing that an infants life is in the balance makes this story so much more important than if you were just trying to peal back the layers of an onion to get to the truth. The characters are ones that you can really like, that you want them to succeed to save baby Justin. I found it fascinating to see the FI team work to see them dig and keep digging for the truth using all the tools that they have at their disp This was a book that once you get caught by the story you just can not put it down. Knowing that an infants life is in the balance makes this story so much more important than if you were just trying to peal back the layers of an onion to get to the truth. The characters are ones that you can really like, that you want them to succeed to save baby Justin. I found it fascinating to see the FI team work to see them dig and keep digging for the truth using all the tools that they have at their disposal. There are twists and turns in this book that you just dont see coming, its one of the things that I really liked about this book. You keep rooting for the truth to come out, for Amanda to find Paul so that they can save their son and live happily every after. If you like mystery thriller books with lost of twist and turns, where things are not always black and white then this is the book for you. I started out really liking this book a lot. I loved the characters and the mystery surrounding the disappearance of a missing man. The bad guy element had my interest, it was so varied and had me trying to guess who was the main bad guy. Then it all fell flat in the end and a lot of fluff was thrown out there. I was so disappointed. I was ready to give it a 4 star but because of the ending I give it a 3 star. Amanda Gleason's baby son is very ill. He needs a stem cell transplant from a matched donor to survive. Unfortunately, Amanda is not a candidate and the baby's father - Paul Everett - was the victim of a presumed homicide though his body was never found. But a friend has sent a cell phone picture that looks like Paul that she recently took in Washington, DC. Amanda takes the picture and all her hopes to Forensic Instincts in the hopes that they will be able to find Paul in time to save his son's Amanda Gleason's baby son is very ill. He needs a stem cell transplant from a matched donor to survive. Unfortunately, Amanda is not a candidate and the baby's father - Paul Everett - was the victim of a presumed homicide though his body was never found. But a friend has sent a cell phone picture that looks like Paul that she recently took in Washington, DC. Amanda takes the picture and all her hopes to Forensic Instincts in the hopes that they will be able to find Paul in time to save his son's life. The five members of Forensic Instincts - six, if you count the bloodhound Hero - take the case and almost immediately find out that it is much more complicated than they had thought. The head of the company is Casey Woods, a trained behavioral and investigative profiler. Marc is a former Navy SEAL and FBI agent. Paul is also former FBI. Claire is a psychic and Ryan is the tech genius. All are committed to helping Amanda save her son. Forensic Instinct's investigation leads to cover-ups, corrupt politicians, the mob and an FBI investigation that they are in danger of blowing. The story was well-done, exciting, and a hard to put down read. I had a pretty good idea who the major villain was early in the story but wasn't at all sure that the team would be able to find Paul Everett in time. When I began the story, I first thought that some of the dialogue was stilted but, as I engaged more in the story, I stopped noticing it. This was a very good story for lovers of thrillers that have high-stakes investigations but without resorting to any sort of graphic violence. The pacing is fast which goes along with the timetable that they need to meet to save baby Justin's life. När Paul Everett försvann från jordens yta trodde hans flickvän aldrig att hon skulle få deras gemensamma barn 6 månader senare. Inte trodde hon heller att hennes son skulle lida av en sällsynt sjukdom som gör att han måste ligga i respirator vid 3 års ålder. Men det är verkligheten och trots att Amanda går igenom en kamp varje dag samtidigt som lille sonnen Justin kämpar för sitt liv, inser hon att Justin inte kommer att överleva på hoppet. Så hon ringer Forensic Instincts. Forensic Instincts be När Paul Everett försvann från jordens yta trodde hans flickvän aldrig att hon skulle få deras gemensamma barn 6 månader senare. Inte trodde hon heller att hennes son skulle lida av en sällsynt sjukdom som gör att han måste ligga i respirator vid 3 års ålder. Forensic Instincts består av 6 medlemmar: Casey, den före detta agenten som mer än gärna tänder på gränsen för att få fram sanningen, Marc, den skrämmande före detta FBI agenten som känner samma som Casey, Ryan, datorgeniet som bygger robotar i källaren, Claire, ett medie som leder teamet till rätt brotslingar och Patrick, en gammal polis och FBI agent som försöker hålla teamet under kontroll. Och utanför fängelset. Tillsammans med deras blodhund Hero bestämmer sig Forensic Instincts att hjälpa Amanda och Justin. Men det blir inte lätt. Alla spår dom har leder direkt till maffian, korrumperade politiker och okända blodband. Casey och gänget inser snart att hela världen har vänt ryggen till dom. Speciellt sen FBI hotade dom om dom inte la ner fallet. Men någonting alla borde veta är att Forensic Instincts inte är typerna som blundar för sanningen. Dom kommer göra allt, bokstavligt allt för att leta rätt på Paul, som kan vara Justins enda hopp om framtiden. A no-body homicide, a desperate mother, a critically ill infant, a deep cover-up, and a relentless investigative team make up the strong backbone of The Line Between Here And Gone, the second Forensic Instincts book by Ms. Kane. Amanda Gleason’s son, Justin, is fighting for his life in the NICU, the unfortunately victim of a rare immunodeficiency disease which could claim his life at any moment. Amanda’s been desperately looking for a bone marrow donor as she is not compatible. Justin’s father is A no-body homicide, a desperate mother, a critically ill infant, a deep cover-up, and a relentless investigative team make up the strong backbone of The Line Between Here And Gone, the second Forensic Instincts book by Ms. Kane. Amanda Gleason’s son, Justin, is fighting for his life in the NICU, the unfortunately victim of a rare immunodeficiency disease which could claim his life at any moment. Amanda’s been desperately looking for a bone marrow donor as she is not compatible. Justin’s father is dead (victim of a no-body homicide) and she doesn’t know of any relatives of his to contact. Amanda’s hopes soar when a friend sends her a picture via text of a man who looks uncannily like Paul. Now she’s turning to Forensic Instincts, a private investigative firm, to find out what really happened to Paul – and if he’s alive, can they find him in time to save Justin?? As the members of Forensic Instincts starts their investigation what they find (and don’t find) lead them to believe Paul is still alive. Yet there are roadblocks from every direction – Amanda’s family members, the mob, the FBI, and other assorted interested parties. Ms. Kane has a way of writing a thriller which begs you to savor it, but at the same time reach the finish as soon as possible. I enjoyed the characters, their depth and their relationships with and between each other. Well-researched and pulling from multiple law-enforcement and investigative disciplines, The Line Between Here And Gone will keep you on the edge of your seat! #2 in the Forensic Instincts. The series has a basically good if not original idea, assemble a team of the best in different disciplines and solve problems - Mission Impossible, The A-Team, U.S.Army Special Forces, etc. The teammates have strong egos and, except for the retired FBI agent, are not averse to breaking rules. So far, so good. The problem is that the book runs 386 pages and could easily be edited to half that. The child's fragile health is discussed ad infinitum, as is the mother's e #2 in the Forensic Instincts. The series has a basically good if not original idea, assemble a team of the best in different disciplines and solve problems - Mission Impossible, The A-Team, U.S.Army Special Forces, etc. The teammates have strong egos and, except for the retired FBI agent, are not averse to breaking rules. So far, so good. The problem is that the book runs 386 pages and could easily be edited to half that. The child's fragile health is discussed ad infinitum, as is the mother's emotional state. The team's intuitive (psychic) can't just get an impression, she has to describe the process and then explain her feelings to at least one other team member. Over a full page is spent describing the completely peripheral issue of how a donor's blood would be prepared for transplant. I finished the novel, but it wore me out. Forensic Instincts series - Photojournalist Amanda Gleason hires Forensic Instincts to find her real estate developer boyfriend, Paul Everett, who disappeared on Long Island eight months earlier and is presumed dead. Having received a cellphone photo that appears to show Paul standing on a Washington, D.C., corner, Amanda believes he's alive-and is her only hope for a donor match for their newborn son who might die without a stem cell transplant. When the Forensic Instincts team begins to investigate, law enforcement agencies stonewall their efforts to gain information at every turn. Most people could probably read this as a stand alone book, but I would suggest reading the first one to see how the team got started and the motivation behind what they do. This time around, they are asked to find Amanda Gleason's former lover. He is probably the only one who can save their infant son's life. The problem is that most people think he is dead Once they start looking into his life, the team finds there is much more than meets the eye. This story had a ton of twists and unexpected t Most people could probably read this as a stand alone book, but I would suggest reading the first one to see how the team got started and the motivation behind what they do. This time around, they are asked to find Amanda Gleason's former lover. He is probably the only one who can save their infant son's life. The problem is that most people think he is dead Once they start looking into his life, the team finds there is much more than meets the eye. This story had a ton of twists and unexpected turns. It is one of those books that has you on the edge of your seat. As I was reading, I could feel the urgency to find this man. I could also feel the hope and desperation of Amanda as she watched Justin fight for his life. It was heartbreaking! I enjoyed this story as much as the first book. I love all of the characters of the team. They are all different, yet they mesh well together. I can't wait to see how the relationship between Claire and Ryan works out in the next book. I was also happy to see Hutch appear in this one. My hope is that heand Kasey will be able to spend more time together in the next book. While I really like the team that is Forensic Institute, what really drew me to this story is baby Justin. I don't think that anyone that reads this one will feel any different. The whole story is a race to save Justin's life, but not in the way one would think. Our team of professionals isn't looking for Justin, but for his father, a man who has a really good chance of being a blood match that will save the baby's life. I was surprised by all the twists and turns that this book took. I felt like While I really like the team that is Forensic Institute, what really drew me to this story is baby Justin. I don't think that anyone that reads this one will feel any different. The whole story is a race to save Justin's life, but not in the way one would think. Our team of professionals isn't looking for Justin, but for his father, a man who has a really good chance of being a blood match that will save the baby's life. I was surprised by all the twists and turns that this book took. I felt like we weren't told everything and we weren't. I couldn't seem to get a handle on just what was up with Paul. I really didn't want to think of him as a bad guy, but the way things were pointed it didn't look good. When all the info came out I was surprised at the way all the things happened, but was glad that the ending put a big smile on my face. I absolutely adore Kane's books. As with The Girl Who Disappeared Twice, this book did not disappoint. From the first page to the last, I felt compelled to read it. I absolutely love the team that Kasey has assemble for Forensic Instincts. They are a great group and I love when she adds a new member. She relies heavily on her team and they all pull together to get the job done. The story of a mother who is watching her child die and could only be saved by a family member struck a chord in my hear I absolutely adore Kane's books. As with The Girl Who Disappeared Twice, this book did not disappoint. From the first page to the last, I felt compelled to read it. The story of a mother who is watching her child die and could only be saved by a family member struck a chord in my heart. From the beginning I was rooting for FI to find Paul. The thrill of the hunt from beginning to end was such a roller coaster ride and I thoroughly enjoyed every second of it. I will anxiously await her next book. Amanda Gleason is desperate when she approaches Forensic Instincts for help. Her baby, Justin, is sick with a rare immune deficiency. His best chance for life is a bond marrow transplant from his parents. Amanda is not a match and his father is dead...or is he? Amanda has received information that Paul may actually be alive. She has hired the team at Forensic Instincts to find out if Paul is alive and bring him back to save Justin's life. This is the second in Kane's Forensic Instincts series. Th Amanda Gleason is desperate when she approaches Forensic Instincts for help. Her baby, Justin, is sick with a rare immune deficiency. His best chance for life is a bond marrow transplant from his parents. Amanda is not a match and his father is dead...or is he? Amanda has received information that Paul may actually be alive. She has hired the team at Forensic Instincts to find out if Paul is alive and bring him back to save Justin's life. This is the second in Kane's Forensic Instincts series. The team consists of a behaviorist, a computer genius, a former Navy SEAL, an intuitive, an retired FBI agent, and a bloodhound. They each use their gifts to discover what exactly happened to Paul when he was presumed dead several months ago. The mystery was good, but some parts seemed to drag out a little too long. My rating: 4 Stars. Bring on the next installment! I hope we don't have to wait long. I really enjoyed The Line Between Here and Gone. Amanda Gleason gives birth to a son months after her boyfriend is assumed dead by murder. The child is born with a rare disease, and his best chance for a cure lies with his father. When a photo shows up which appears to be the father, Forensic Instincts is called in. A very good page turner! I can barely remember the description of Ryan (other than "gym rat"), but in my head he looks like Chris Evans playing Jensen in The Losers. That is a very good look. This is now one of my new favorite authors. This actually is the second book in the series. I didn't know that, but it's OK. The Girl Who Disappeared Twice is the first one. Ein grossartiges Buch, welches mich positiv überrascht hat. Received Andrea Kane's book. Looking forward to reading it! This is the second book in the 'Forensic Instincts' series. The Team is made up individuals who look to get the job done, and they do, by whatever means it takes. In this book a baby's life is at stake due to a rare immune deficiency. Unfortunately his Mother is not a match and the father is no where to be found. The Team is hired by the Mother to locate the father, who may be a potential match, but the Team encounters many obstacles that lead to more unanswered questions and dead ends. Although This is the second book in the 'Forensic Instincts' series. The Team is made up individuals who look to get the job done, and they do, by whatever means it takes. Although this is usually not a problem for Forensic Instincts, this time secrets and lies lead a trail from the Hamptons to Washington and to the FBI. Meanwhile a small child's life is at risk waiting for a perfect match, and the clock is ticking. The writing is atrocious! It reads like we are listening in to a group of 10 year olds planning the classroom play.It is bad writing to have the characters tell each other what they will do, rather than the author tell the reader what happened. This is the format followed by a lot of TV crime shows where there is much talk and little action, because with TV production, action scenes cost more than talk scenes. This is not a consideration with books. Coming in March 2019 from Andrea Kane: DEAD IN A WEEK. Andrea Kane is the New York Times and USA Today bestselling author of twenty-nine novels, including fifteen psychological thrillers and fourteen historical romantic suspense titles. With her signature style, Kane creates unforgettable characters and confronts them with life-threatening danger. As a master of suspense, she weaves them into excit Coming in March 2019 from Andrea Kane: DEAD IN A WEEK.